TNTs (Tago nang Tago) or illegal immigrants living in Europe have become the subject of an intensive crackdown by European Union (EU) border security forces and European police in a bid to secure the continent, Pat Valenzuela of OFW group Migrante-Denmark revealed in a report on ABS-CBN News. The group now warns TNTs and Filipinos who live in European countries to make sure to have their documents ready at all times, so they will not attract suspicion from the authorities, Valenzuela urged. Valenzuela said Migrante-Denmark understands the plight of the undocumented Filipinos who chose to stay in Europe after the expiry of their work contracts or tourist visas. According to the migrant group, these TNTs are simply trying to earn a living in these foreign countries to help support the families they have back in the Philippines. 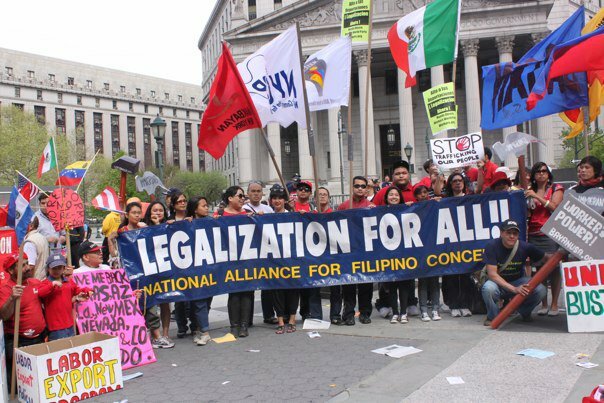 The group added that they believe these TNTs would go back to the Philippines once they earn enough for their family; though Migrante-Denmark did not place a timeframe for this. What these TNTs are doing is not a ‘crime’, according to Migrante-Denmark, because these people are merely trying to make a living for their families despite the lack of proper documents such as work visas. The group has already helped several of these TNTs by providing legal and medical assistance to them. According to Philippine News Central, Migrante-Denmark claimed the supposed massive crackdowns against illegal immigrants are being done quietly. FRONTEX (EU border security forces) and the police are first focusing on human smuggling and drug trafficking across countries in Europe, Valenzuela said, but there were also a number of illegal immigrants who have been apprehended. So far, the OFW group said there were no reports of Filipinos apprehended in the crackdowns, which officially began in Denmark sometime last month. However, the migrant group warns Filipinos to always take precautions like bringing their sona, especially when riding trains that would cross borders.